The PBS television series “Inside California Education” features a Long Beach Unified School District pilot project with Khan Academy, which provides online video tutorials and other tools to help boost student achievement. As part of the pilot project, Khan (khanacademy.org) provides professional development for teachers, helping them to integrate online lessons into their classrooms. Khan supplies its online content at no cost. The program is one of the first of its kind, with Khan now in its first year of piloting such partnerships in the U.S. More than 100 teachers agreed to start the pilot program in local schools. The PBS segment includes interviews with students, teachers, administrators and Khan officials. 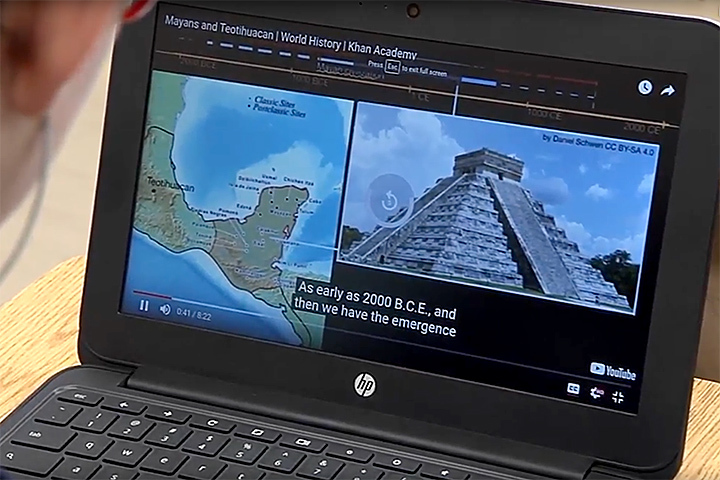 KHAN ACADEMY – As part of a world history lesson, a student uses a Khan Academy online tutorial to learn about Mayans and the ancient city of Teotihuacan in Central Mexico.